Worryingly, every day in our lovely, peaceful county of Norfolk we are seeing a sharp rise in knife crime. Especially in Norwich, Great Yarmouth and in Lowestoft (Suffolk). The first thing you need to understand is using a knife requires close contact range to be effective. The less space between you and the knife means less time to react and far greater chance of getting seriously hurt. This is known as the reactionary gap in the self defence community. The first question is you have got to ask yourself is, how much is your life worth. How much money would you be prepared to fight for your life for? £10, £20, £50, £100, £200? Before you even think about it and ego steps in just ask yourself this. How much this will cost your loved ones, if you were to get seriously hurt or die fighting over a few quid in your pocket? Yes, now I have your attention. It’s not worth it, just hand over what you have and learn from this situation. Why did you get robbed? It’s because the robber thought you were an easy target and you were not in tune with your surroundings. A common self defence term, “your situational awareness” was poor and you made yourself a target. If the motive is something even more sinister such as kidnapping, sexual, life threatening and you have no alternative to fight, you must be prepared for total commitment mentally and physically, to survive. The best knife defence is simply avoid it in the first place. The sooner you see or feel a potential threat, look at a rapid exit strategy. If you are not cornered, simply run as fast as you can. Creating distance is always the best strategy with a knife, if you can’t run then find a temporary barrier between you and the attacker. 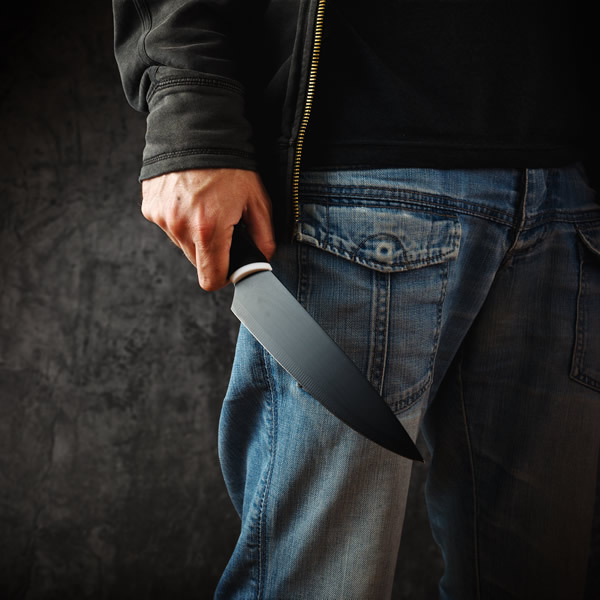 Look for an improvised weapon, anything to hand that will add distance between you and the blade or deter the attacker. The most important one is to watch the hands and posture. What are the hands doing? Are they in pockets or are they reaching around the clothing. Something I do whilst working on the doors is to look at body language, aggressive posture and hands. For instance, watching individuals that I have identified as a potential threat. Which hand are they holding a glass with, what pocket they keep items in and how they hold things is a big tell on how they will handle a blade. Also which is their leading leg is helpful in seeing what’s their stronger side. This is not always possible, as some attacks and robberies tend to happen very quickly when the victim has been caught unawares. So key to any self defence training is situational awareness and how to train your mind in spotting threats quicker and dealing with them. Observation games in military circles are an important part of training and eventually, when practiced enough, become instinctive. For instance police drivers are taught ‘commentary driving’, a process where the officer commentates all hazards when driving. Eventually when done for long enough the driver doesn’t have to do this as his brain has been taught to do this subconsciously. The quick explanation for this is simple – you observe / see the threat, you then orientate to the threat, you decide what to do, then you act. What Boyd realised was that you can trap an enemy fighter in the loop and if you keep him in the loop you will guarantee victory. So how is this done? It’s simple, the attacker observes, he orientates and at this point you change so the attacker has to observe and orientate again. If this process is continued you trap them in a loop they can’t get out of. You are taking initiative and you are keeping them on the back foot. How can this be trained in the self defence doctrine? By movement and keeping your relative position better than your attackers. Action and reaction, by responding to the attack and interfering with the attackers thought process by changing rapidly. For more on OODA loop check out this great article about Lt. Colonel John Boyd. Controlling the reactionary gap by closing the distance and not allowing the knife to slash a stab. Or a very common method for disarming an individual with a knife and is widely used is pat, wrap and attack. Blocking the arm with the blade, wrapping the arm tight and stopping a continuous stabbing motion called the ‘Sewing machine’. Attacking by raining numerous strikes with knee, elbows, hands and feet until the attacker is no longer a threat. For this to be effect it requires an immense amount of practice and simulation of a knife attack in what we call a pressure test. Normally conducted with marker pens, marker knifes and in some causes a shock knife. White shirt shirts are worn and the attacker will randomly stab and be non-compliant. This continues until the defender either gives in or controls the attacker until he disarms the the blade. Even with intense training results are never guaranteed, so best advice avoid, run, make a barrier or find an improvised weapon. Don’t listen to your ego it will get you killed. Fighting someone attacking you with a knife is a last resort, which really could be the last resort! Fill in the quick contact form below and we will get back to you, the sooner you start the better!